I figured I'd ask out of interest, but has anyone increased the size of the flares on their U12? It's a massive job, I guess, since for the rear to be flared out more, the door needs to be flared as well, but I'm a big fan of the wide body kits and such, so I'd be curious to know if someone's done this before, or thought about it in as much detail as (or more than) me. As an added bonus you could run some crazy wide rims depending on how much it's flared. It looks tough. You are right about the back being a PITA. There was that orange one from Malaysia which had flared nicely. In my opinion if you wanted to do it, get some aftermarket bolt on ones, cut off the existing and bolt the flared ones on. The back ones would require cut and weld as there are two layers of metal involved there. Alternatively cut slots in the existing so it fans out, then fill in the gaps with fibreglass. 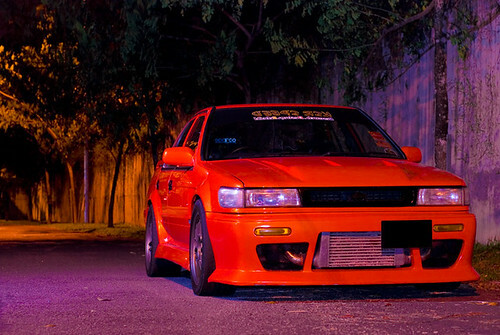 I've seen some GC8's with the wide body kits, and I gotta say, the rear doors flared do look pretty crazy. Tough to do, but not undoable. Ignore the kit, I'm not a fan of it either, but the rear door is exactly what I had in mind, albeit running back in flat due to lack of wbk skirts. I could do the bolt-on flares, but to make it run flush i'll still need to flare the rear door, otherwise it'll look silly, this sharp flare coming out at a 70 degree angle right before the rear door. There's plenty of meat in the stock flares, it's quite thick metal, so there'd be a fair bit to work with when thinning and extending, given that I'd be chasing somewhere between 30-50mm. Ah, pipe dreams are nice, arent they? Flares like that VW would be craaazy. Dunno if it'd look good on the U12, but worth a crack! 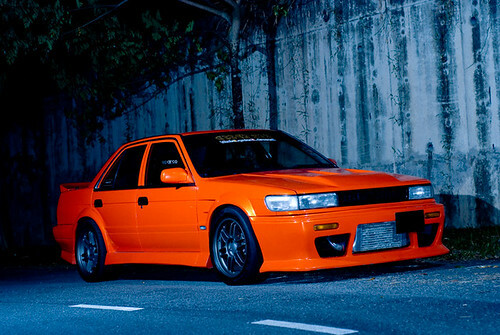 Is that orange U12 flared? I know the kits not stock, so it's hard to gauge from that, but just by how far the flares on the rear extend out... it wouldnt have been much added?